Size of this PNG preview of this SVG file: 620 × 600 pixels. Other resolutions: 248 × 240 pixels | 496 × 480 pixels | 794 × 768 pixels | 1,058 × 1,024 pixels | 1,550 × 1,500 pixels. 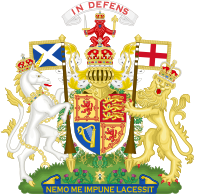 English: Royal Coat of Arms of the United Kingdom of Great Britain and Northern Ireland as used by Queen Elizabeth II from 1953 to the present (as used in all her realms except Scotland). Français : Armes royales du Royaume-Uni de Grande Bretagne et d'Irlande du Nord, telles qu'utilisées par le reine Élisabeth II de 1953 à aujourd'hui, excepté en Écosse. Italiano: Stemma reale del Regno Unito di Gran Bretagna e Irlanda del Nord, usato dalla regina Elisabetta II dal 1953 ad oggi (tranne che in Scozia). Русский: Королевский герб Соединённого Королевства Великобритании и Северной Ирландии, каковым он используется королевой Елизаветой II с 1953 года и поныне (в изводе, используемом во всех ея владениях кроме Шотландии). 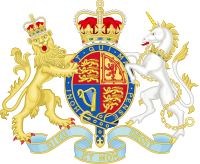 Other usage information The National Archives has a PDF regarding usage of the UK coat of arms. 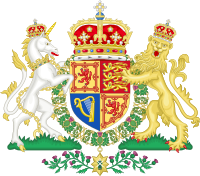 Royal Coat of Arms of the United Kingdom of Great Britain and Northern Ireland as used by Queen Elizabeth II from 1953 to the present (as used in all her realms except Scotland). Королевский герб Соединённого Королевства Великобритании и Северной Ирландии. 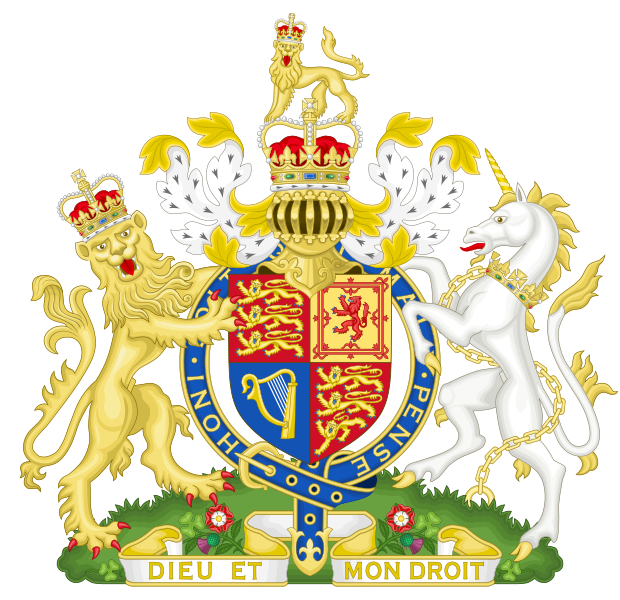 Armes royales du Royaume-Uni de Grande Bretagne et d'Irlande du Nord, telles qu'utilisées par le reine Élisabeth II de 1953 à aujourd'hui, excepté en Écosse. Stemma reale del Regno Unito di Gran Bretagna e Irlanda del Nord, usato dalla regina Elisabetta II dal 1953 ad oggi (tranne che in Scozia). 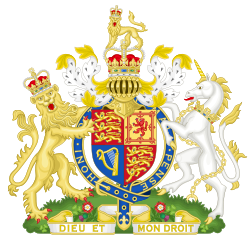 05:19, 9 August 2018 1,550 × 1,500 (1.84 MB) Unclehowell The 1801 UK Societies Coat of Arms has the Unicorn unchained, whereas Great Britain (the Country)/ the Royal Families Coat of Arms has the unicorn chained down.